Before I continue it's vital to remember that every skin is hugely different. What works for one person may be hell on earth for another. Skincare is a minefield that must be trodden carefully, especially if your skin is acne prone or sensitive. Lush will never categorise people into different 'skin types' and for a good reason too. Your skin will change depending on your diet, hormones, water intake and often the seasons will affect it too. Therefore, it is important to try and 'listen' to your skin and adapt your routine to what the skin needs at that particular time. Luckily, my skin doesn't seem to change too drastically from season to season but even I find myself needing/wanting slightly different products throughout the year. Having said this, the routine I am about to describe seems to be the 'base' or standard for me. My skincare usually begins at night. I use 'Ultrabland' to remove my makeup. The first ingredient is almond oil and as a carrier oil, this beauty works by carrying (hence - 'carrier oil') all the other lovely ingredients down to the deeper levels of the skin. Additionally, almond oil is incredibly moisturising, softening and gentle on the skin with a low comedogenic rating. Honey is a natural humectant which essentially means that it locks in the skin's moisturiser. You may have started to notice a theme of hydration and moisture with this product already. When I find my skin needs that extra boost of moisture I simply use this product as a moisturiser rather than a cleanser and find that it's a powerful solution to dryness. 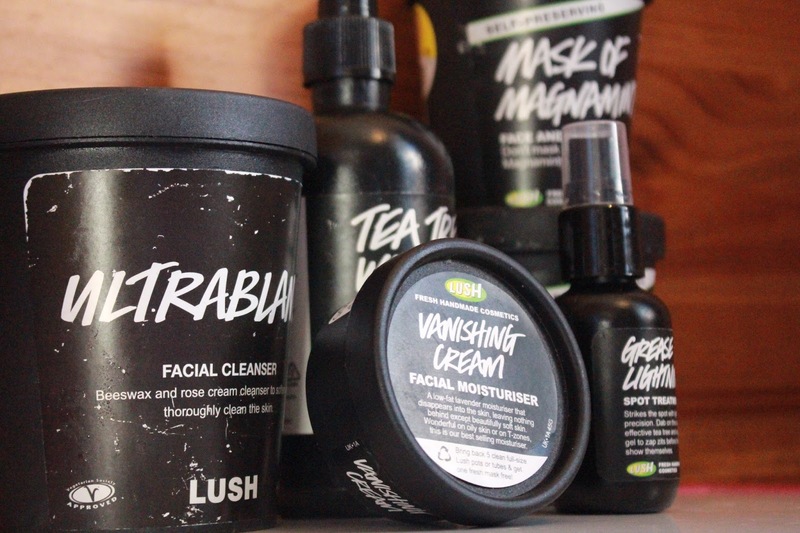 As the Lush founders' No. 1 Desert Island Product Ultrabland is the perfect, gentle cleanser that every skin needs. 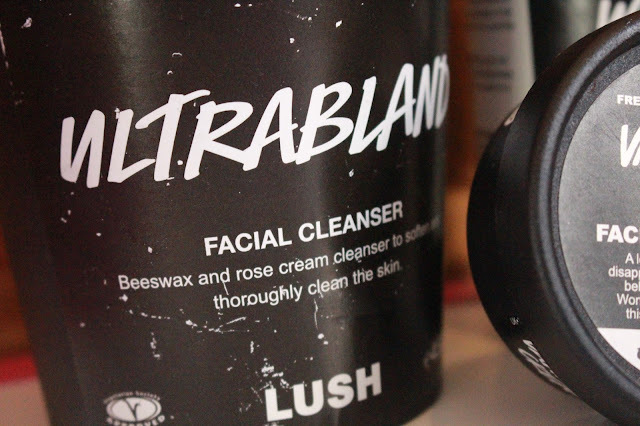 To use Ultrabland you simply scoop a little out of the pot and massage into the skin. Then, using a damp cotton pad or flannel remove the product. My personal routine makes use of Lush's 'Tea Tree Water'. I spray a cotton pad with the product until damp and use the toner to remove Ultrabland. 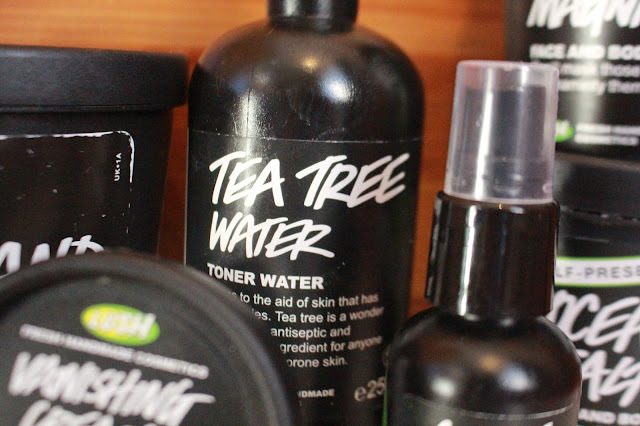 Having tested taking Ultrabland off in different ways, I have found that using a toner water has been the most effective - particularly if using to remove makeup. The tea tree water and grapefruit water in this product work in harmony to be both antibacterial (perfect for acne prone skin) and gentle. Normally, I find myself double cleansing and using the Burts Bees Anti-Blemish Solution wash after Ultrabalm however, this is not essential. After cleansing, you should always moisturise. It is a common thought that those with oilier skin should not moisturise. in fact, it is essential that you do so to prevent your skin from producing excess sebum. For me, cocoa butter in Lush moisturisers breaks me out massively. 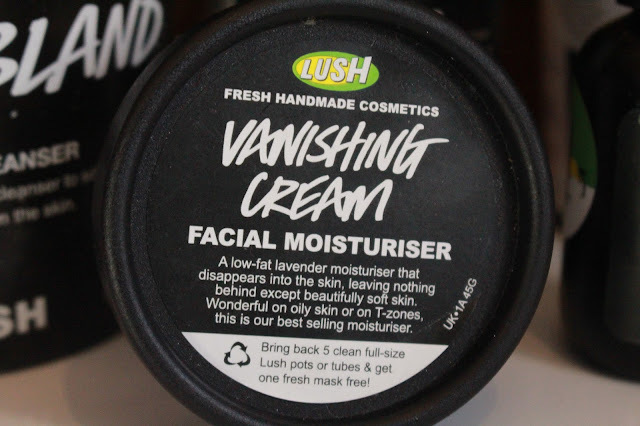 'Vanishing Cream' is a cocoa butter free moisturiser that contains rose and lavender meaning that it is aids in the reduction of redness and is balancing on the skin. Acne prone skin is often due to an imbalance and lavender can help resolve this. Vanishing cream is also Lush's lightest moisturiser yet the shea butter adds the needed moisture. 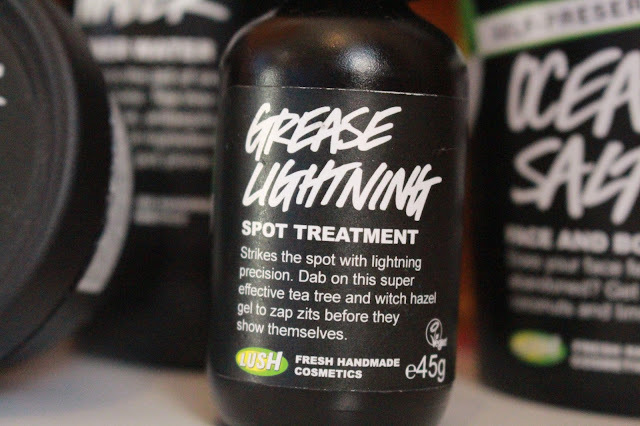 Following the moisturiser, I use 'Grease Lightning' on any areas that are particularly problematic. I have also found that the combination of aloe vera, witch hazel, tea tree and lavender has been particularly effective in my acne scarring. there has been a significant reduction in red marks on my skin since adding this to my permanent routine. 'Mask of Magnaminty' and 'Ocean Salt' (both in the self-preserving variation) are staples in my routine that get used 2-3 times a week. The self-preserving versions of these products mean that they keep them self 'clean'. 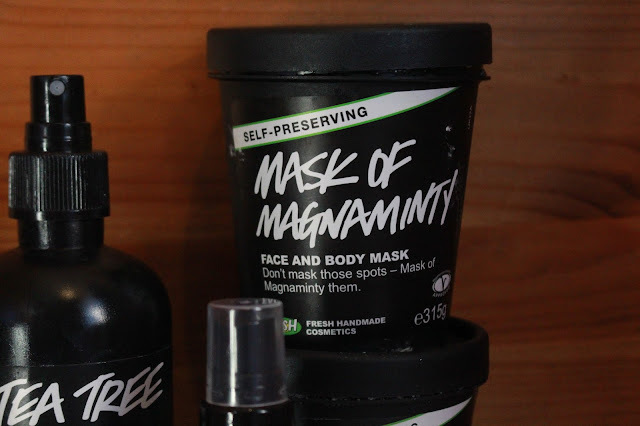 By increasing the amount of honey in Mask of Magnanimity and glycerine in Ocean Salt, Lush has been able to create products without the need of preservatives. 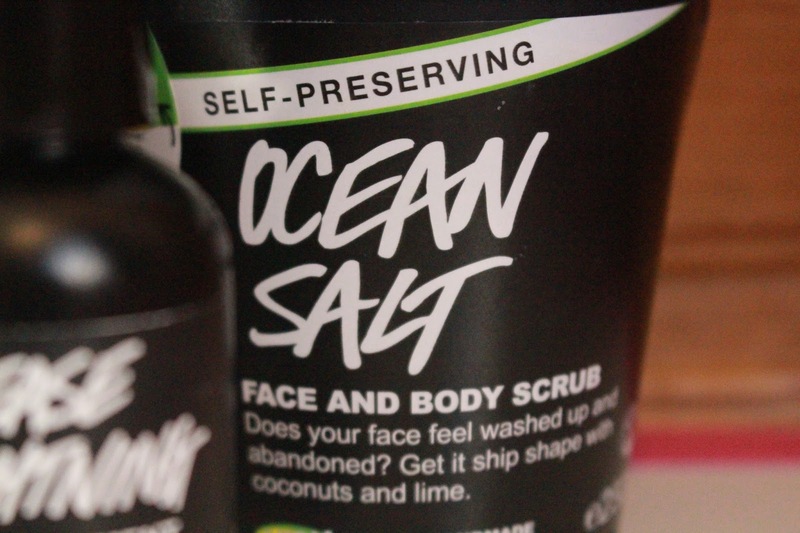 Though Ocean Salt is labelled a scrub I often find myself using it as a mask also. This is because of the fact that vodka infused lime. Lemon/lime are said to be lightening agents and so for me, this ingredient works well to reduce the red marks caused by the previous acne. This citrus element is also very brightening and really awakens dull and tired skin. 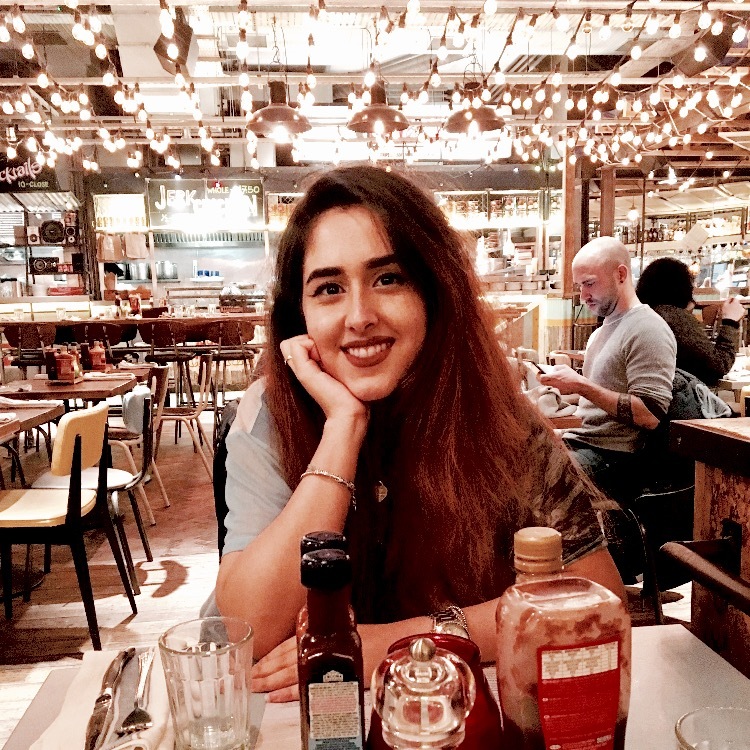 Let me know which (if any) Lush products are a most for you! I will also most likely be doing more Lush posts and reviews in the future so I would appreciate any suggestions! Thanks for taking the time to discuss this, I feel stronly about it and love learning more on this topic.